WASHINGTON — Joe Biden has now jumped on the anti-Putin bandwagon by saying that the Russian president doesn’t have a soul. 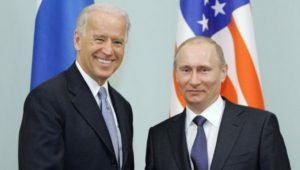 Reuters reported that Obama’s vice president Joe Biden concluded that Putin had no soul after a 2011 meeting at the Kremlin. These comments came after Russia has been blamed for the downing of a Malaysian commercial airline MH17 in eastern Ukraine, where pro-Russia rebels control the area. All 298 people on board died.